I’ve withdrawn todays blog and replaced it as I was exhausted yesterday and pushed out my article incomplete. What I wanted to share was an easy and quick way to access all the variables collected in your deployment. I’ll republish my article on ZTIGather when its complete. During your deployments, in the folder C:\MININT\SMSOSD\OSDLOGS there’s a file called variables.dat. 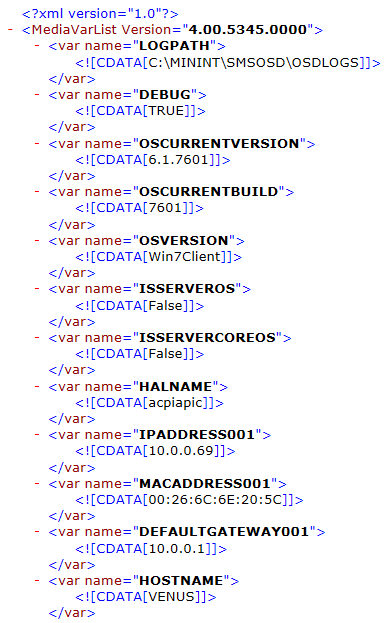 This is where MDT stores the values for all the properties that it has collected. Going through this is one method of understanding what information MDT collects and also, the variables that you can use in your task sequence conditional statement or script variables. You can also edit this DAT file on the fly and change the values in it, but I’ll talk about that in a future blog. This will save you reinventing the wheel by scripting information that is already collected. This entry was posted in Deployment, MDT 2010 and tagged MDT, Variables. Bookmark the permalink.